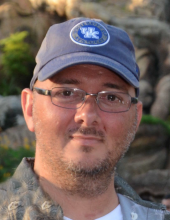 Joseph Paul Sydow, 39, of Richmond, passed away on Thursday evening, April 4, 2019 at the UK Hospital in Lexington. Joe was born in Bay City Texas on January 7, 1980 and was a 1998 graduate of the Comanche High School in Comanche Texas. Joe was an inspiring entrepreneur and in 2014 he opened Rich City Vapors. Most of all Joe loved his family and spending time with them was his favorite thing to do. Funeral Services will be conducted at 7:00 PM Tuesday, April 9, 2019, at the Combs, Parsons & Collins Funeral Home, W. Main St., Richmond. Visitation will be after 4 PM Tuesday, at the funeral home. "Email Address" would like to share the life celebration of Joseph Paul Sydow. Click on the "link" to go to share a favorite memory or leave a condolence message for the family.